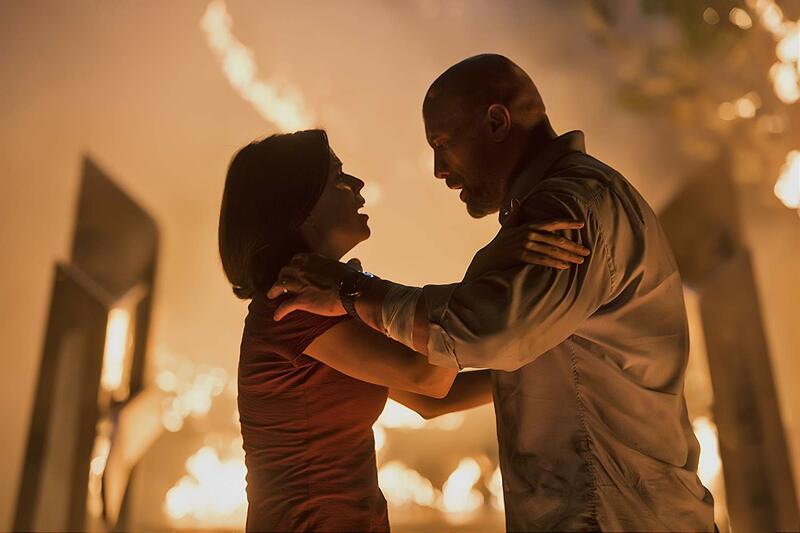 It’s time for movie watchers to consider where Dwayne Johnson falls on the action movie scale. He’s not Bruce Willis. Bruce Willis punched an asteroid with a nuke. Johnson only punched a torpedo. He might be Schwarzenegger tier; Johnson wrestled some mighty monsters in Rampage and Schwarzenegger brawled with bounty hunter aliens in Predator. Regardless of Johnson’s current standing, he’s not at Skyscraper’s tier. Yet, anyway. You cannot cling to the side of a burning building, 300 floors above China, using only duct tape. Great product placement, if lacking a suitable “don’t try this as home disclaimer.” Not even Johnson can repair a wound (caused by six inch steel debris piercing his shoulder) then hold up a couple hundred pounds of collapsed bridge so his family can cross. Skyscraper isn’t a movie that exists for anything other than escapism. Fine. Johnson busts up an apartment brawling with a turncoat friend, taking shots through furniture and into a television. That’s fun. Later he’s dodging bullets as if The Flash and using his leg prosthetic like it’s part of a jungle gym. If there’s anything offensive in this mix of popcorn action and disaster movie, it’s how little the amputee angle works as anything more than a gimmick. That leg is there to put a small spin on an uproariously dopey farce rather than empower the disabled community. That, and defy all known physics as said leg slips away while Johnson hangs upside down, staring at the scenery hundreds of feet below. Set in China solely because of growing box office returns internationally, Skyscraper barely puts the rules in place of this technologically rich “tallest building ever” before things start catching fire. That’s Towering Inferno, only this building isn’t yet populated with a multitude of movie stars. It’s just Johnson, his family, and some Scandinavian terrorists out for a USB drive. And yes, Skyscraper’s entire onus is a mere flash drive. At one late stage, Johnson wields a samurai sword. That’s wild. If that was more of Skyscraper – some ridiculous near self-parody concoction – maybe then Skyscraper finds its voice. But no, it’s designed to be an audience cheering, masculinity-laced, save-the-women thriller, played with nary a smile anywhere on screen. Skyscraper’s finale takes place in a room that’s effectively a high-tech hall of mirrors. The only logical application for such a room is this movie’s finale. It exists because Skyscraper needs a different visual barometer than Johnson blandly staring down his foe. Unfortunately, that’s all it turns out to be, leaving one to wonder the months of planning and creative processes that went into the design of such a set-up, all so something could look cool despite practicality. That’s a lot of what makes Skyscraper actually. Yes, it might look cool to see a beaten and battered Dwayne Johnson making a last second save with his leg prosthetic, but to even consider the possibility doesn’t seem all too practical. Dwayne Johnson jumps ahead of his placement in the action movie pantheon via Skyscraper, a dopey blockbuster with hardly a wink or smile to be had.